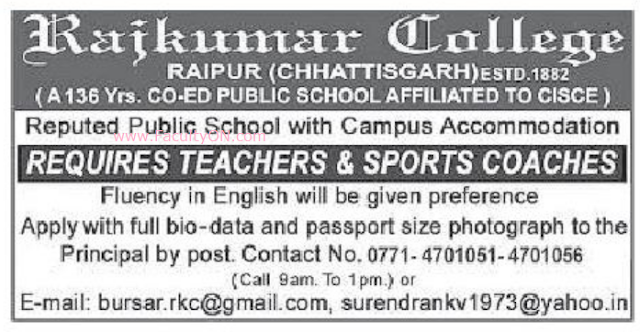 Rajkumar College, Raipur has advertised for recruitment of Teaching Faculty- Teachers / Sports Coaches jobs vacancies. Interested and eligible job aspirants are requested to apply immediately from 27th November 2018. Check out further more details below. About School / College: The aim of the College is to prepare boys academically, physically, psychologically and morally in secular environment for entering any walk of life. This is achieved by seeking to develop character, promote espirit-de-corps and dedication to a purpose by inducing a patriotic outlook and desire to serve the country in any capacity with efficiency, industry and zeal. The overall emphasis is focussed on achievement of an all-round development of the child into a young man and woman possessing a maximum of those values which will make him or her a better human being or a constructive citizen of the country. How to Apply: Interested and eligible candidates are requested to send application along with CV, copies of certificates, PAN card, Aadhaar card and PP size photos to the postal address or email address given below.